This is the tagline of World IA Day 2016 Singapore, the first of its own to be held in the little red dot. And true to that, speakers and keynotes presented in this first pilot session were broad and covered varying topics related to Information Architecture (IA) and beyond. The opening speaker and probably the most celebrated speaker of the day kicked off the session with her keynote on relationships in IA. Through an interesting analogy from the movie ‘Love Actually’, Donna talked about drawing out relationships between characters. A usual movie website would list characters and cast in a list format, describing each character in details. But would readers be able to understand the underlying relationships between the characters and how they tie up to the plot? Meaning and relationships are at the core of IA, but we often make them too simple. Through Love Actually, we were given a walkthrough how relationships among information work. In her keynote, she discussed several cases of sites that use relationships well and badly. Consider how eCommerce stores like Amazon and music streaming sites like Soundcloud and Pandora offer recommendations for users. Based on your preferences, the sites would generate recommendations through logical patterns and algorithms. And often, recommendations are weak, surface options, like recommending books by the same author when you have bought books from that same author, or suggesting songs by the same singer because we have favourited one song by that same singer. The logic is simple: categorising information like songs and books in logical categories based on their attributes like author and singer. In this context, using scientific classifications for recommendations are often superficial, drawing connections and presenting information without considering deeper relationships. Imagine if your favourite song streaming site picks up song genres and tempos of songs you listen to most and matches recommendations that are similar sounding? Would you have been more likely to enjoy the recommendations? Classification theories and categories are arbitrary and culturally specific. The same classifiers and modifiers one user may use may not make sense for others. Donna went on to outline very broad steps for identifying and building up relationship models. Award-winning architect Mark Wee opened his keynote by sharing his experience of working on The Cranes, a multi-shophouse project in Joo Chiat. As a practitioner in the field of experience design, Mark shared that his design concepts revolve around the idea of community and is inspired by the diverse Joo Chiat neighbourhood. Mark shared how technology is increasingly shaping our daily lives. The very experience of life, especially in an urban environment, needs to consider how products, services, and the physical environment come together. One of my favourite inspirations from his talk was his introduction on Edge, possibly the world’s greenest and smartest building. It knows where you live. It knows what car you drive. It knows who you’re meeting with today and how much sugar you take in your coffee. (At least it will, after the next software update reported by Bloomberg). The integration of architecture, technology and information facilitates how the Edge and its employees interact. Every day, dashboards track everything from energy use to when coffee machines need to be refilled. On days when fewer employees are expected, an entire section might even be shut down, cutting the costs of heating, cooling, lighting, and cleaning. Another of his interesting sharing was on Superkilen, a public park in the Nørrebro district of Copenhagen, Denmark. We watched a video featuring artists behind Superkilen, explaining how this public park was a collaboration based on extreme civic participation. It was an extreme example of citizen inclusion and collaboration: how a very diverse group of people in culture, social standing and nationality shares information, and came together to bring stories to a shared space. It was a fresh take on how information is considered and interpreted in creating meaningful experiences by architects. In many ways, Mark’s stories were relatable to what Donna talked about, valuing relationships as well as scientific facts when creating experiences. Heading the Organizational Transformation at Land Transport Authority (LTA), Agnes shared her insights on design thinking, and what her team are doing to make commuters smile. The problem she faced? A constantly increasing number of cars on the roads, even with continuous improvements in our public transport. She shared her story of using data to tell the “what” from her users, and stories to tell the “why”. She quickly realised the increasing number of cars was not an efficiency issue of public transport, it was an emotional issue. People are not switching to public transport because they don’t have to. Owning a car marks one’s status and identity. It is an emotional treatment, a symbol of an adult’s emerging identity. So this brings them back to their problem. Beyond focusing on the infrastructural solutions, Agnes’ team explored ways to assess and improve the travel experience. They spoke to extreme cases: families with young kids who deliberately choose not to buy cars. And through these interviews, they started to piece out what matters to the experience of commuters and experimented ways to create an engaging atmosphere for train rides like the football-themed cabin during the World Cup month and the Star Wars-themed trains during the world premiere of the latest installment of the series. By the end of her talk, I was impressed by how a government officer in her hard-line field of work relates to the concept of policies as hypotheses of how the world works. Policies are just like any experiences created by humans for humans, to be tested, experimented to tell if they work. This is evidence-based policy making. We are looking at how governments, policy makers and service delivery planners can design more human-centered experiences for citizens. And it’s always welcoming to see design thinking and Agile concepts being more widely adopted in unexpected organisations. Through a very personal story (abstracts of his memoir), Patrick discussed how humans have stored our memories and our knowledge in the form of stories associated with places and environments. Patrick questioned the relationship between identity, memory, and place, and asked if we need to re-think our discipline from one that creates separate abstract spaces that we go to for information and knowledge, to one that leverages the concrete environments we live and interact in. There’s always a sense of embodiment when we talk about familiar places storing experiences and the concept of physicality for knowledge storing and transfer. It was no doubt a deep, intriguing topic, and one that calls for a whole new session to delve into. In this short, casual topic, Preetam shared his personal experiences of connecting with local people across many cities, reaching out to students, professionals, artists, teachers and immigrants. He named nostalgia, food and books as good conversation starters and sources of information to help him understand new places. Through barcamps, local meetups and public places like libraries, we learned how Preetam enjoys relationship hacking to decipher cultures and learn from the lives of the people he has met. At Google, Lucian works on keeping people safe online, but his topic today was not on cyber security. He discussed about the importance of metadata in the current digital world, how Google Photos cleverly uses artificial intelligence through image recognition technology to locate and geotag photos. The code looks for telltale visual cues such as building styles, languages and plant life, and matches those against a database of geotagged photos. You can look for photos with “dogs” in them, “sunset,” “trees” or “coffee”, and Google will offer up categories for you. Impressed? Try searching for a color, and the app will bring up photos with that respective shade. I’ll confess that I’m not a big fan of metatagging. The staggering amount of information we store in our computers: photos, documents, music, digital files and more. How do we manage these information and the stories they tell? Lucian offered a very hopeful perspective for us lazy taggers: that technology is here to save the world. All in all, not a lot of questions were raised for the speakers, but the whole session was refreshing and sufficiently insightful for me to leave with many questions on my mind. I walked away with many inspirations refreshing my knowledge on IA, ideas prompting me to explore more, a new membership with The IA Institute and free licences for prototyping tools which I can’t wait to try out. 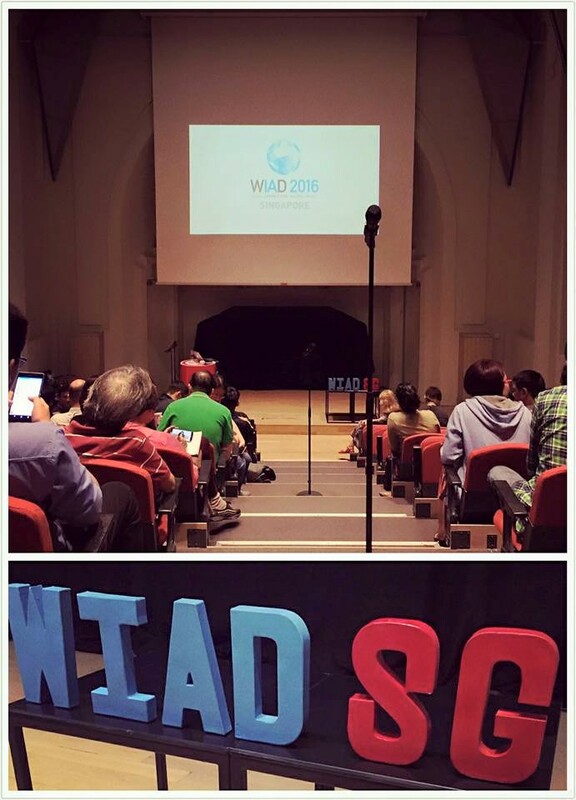 Thank you WIAD Singapore, till the next World IA Day in 2017! This entry was posted in Happenings at Titansoft and tagged Information Architecture on March 1, 2016 by Lorraine Lai. I’m a writer, editor and content strategist with love for content of all sorts. Always curious to learn something new about user behaviours in the area of user experience, as well as analytics and market research work. When I'm not working with words, I’m probably reading stories or dabbling with creative works like photography, music and lifetime hobby of traveling. I’m currently heading the Content Team at Titansoft, overseeing content quality and planning content strategies for web applications, including SEO and information architecture.